It's right there in the very first amendment to the US Constitution. It's considered a cornerstone, a foundation block of American society. Yet freedom of the press is under threat as never before. And not just in the US, but around the world. The UK-based human rights and freedom of expression advocacy group Article 19 warns in its 2017 Expression Report "that media freedom is at its lowest level in ten years". With a record number of journalists in prison around the world, earlier this year the Committee to Protect Journalists (CPJ) organized its first ever international mission to the United States, to deal with growing violations of press freedoms in a country whose name remains, for many around the world, synonymous with ideals of liberty and democratic rights. In 2017 alone 44 physical attacks against journalists were reported in that country. Even neighbouring Canada is in trouble, with a 10-point fall on the World Press Freedom Index in 2016 and a further four-point fall last year, leaving it out of the Top 20 countries for the first time. This is due to efforts by the federal Royal Canadian Mounted Police (RCMP) to criminalize journalists covering protests as well as spying on journalists and demanding reporters hand over confidential material, in contravention to norms of a free press. Journalists -- and the public and civil society which rely on the news and analysis which they provide -- are right to be concerned with the grim situation. While journalists continue to display an everyday courage by doing their work despite the growing environment of threats and menace, what can members of the general public do to support journalists and freedom of the press in the United States and beyond? That's the question Scott McDowell posed to himself eight months ago, as his sense of frustration grew. The long-time music fan, radio broadcaster and co-founder of recording label Kith and Kin decided to turn for help to the community he knows best: musicians. 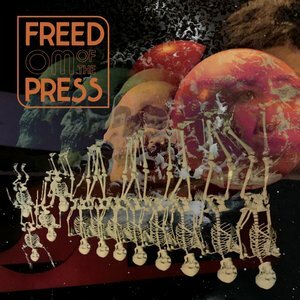 Barely half a year after committing himself to the project, Freedom of the Press: A Modern Psychedelic Music Compilation to Benefit the Freedom of the Press Foundation has finally launched. The compilation features 14 never-before-heard tracks by modern psychedelia bands, such as Garcia Peoples, the Weather Station, Hans Chew, One Eleven Heavy, Elkhorn, and more. The proceeds will all go toward supporting the work of the Freedom of the Press Foundation, a non-profit organization established in 2012 to support and defend public-interest journalism. In addition to supporting journalists and press freedoms, the group supports the development of the digital encryption tools necessary to ensure journalists' free communication and prevent illicit government or corporate surveillance. McDowell conceived of the benefit compilation as a way of helping push back against the "slow degradation of one of the cornerstones of a free society, one of the cornerstones of democracy" -- freedom of the press. For McDowell, one of the most frustrating parts of this process, for someone who doesn't identify as a journalist yet who recognizes how much he relies on journalism to keep him informed, is the "sense of ambient dread that our essential freedoms are being slowly pulled apart in the US". "Over the last six to 12 months it really feels like the press is under attack on a consistent basis," he says. "It takes the guise of ... a concerted effort to discredit journalism and the news as valid and worth listening to." The scariest part of this process, he says, is that "people are becoming numb to it". "It affects all of us. "I'm not a journalist but I'm a writer, and this idea of defending the people with honesty and truth, reporting on things that can be dangerous, rooting out corruption ... requires a certain amount of courage, and journalists who have that courage. We need to encourage that sense of courage and help people take chances. Media organizations can be susceptible to pressure and that leads to compromised [reporting] or censorship." "The first line of defense against a tyrannical government is a free press." "There was a compounding sense that I needed to try something," he says. He decided the best approach was to start with his own community, and began reaching out to musicians he'd worked with over the years. The response was instant: the musicians and artists he approached all jumped at the opportunity to help out. They appreciated the chance to get involved with a project like this, he feels. "I think it's because everyone wants to do something, and sometimes people don't understand how to actually be active in the current situation that we have in America," he reflects. Why psychedelic rock? For McDowell, the '60s-style chords, harmonies and folksy psychedelia of the modern psych rock movement are more than just entertainment; there's a real desire within American rock to rediscover the music that sparked a progressive-minded social revolution 50 years ago. "I feel there's sort of a zeitgeist that's occurring right now in music, a ... revival or extension of what occurred in the '60s or '70s. To me, it relates really nicely to the ideas of free speech and equality and open society that sort of began in the '60s." What excites McDowell about the modern psych scene is not just its links to the spirit of the '60s and the liberatory ethos of the era, but also the way in which modern bands are channelling that spirit in new directions. "There's some really great new bands like Garcia Peoples that are on the compilation that are representative of this new sound. It's not a new sound but it's sort of a link in the chain, if you will, to psychedelic music of the past. There are all these bands coming from this point of view and mindset, and not trying to be regressive but really doing their own thing within the confines of a genre of music. It's really exciting, it just seems like a real moment." There are other close ties between psych rock and the struggle to protect civil liberties, McDowell notes. He cites John Perry Barlow, one of the co-founders of the Freedom of the Press Foundation, who also started the digital rights advocacy organization Electronic Frontier Foundation. Barlow, who died in February, was also a lyricist for the Grateful Dead. "There's a direct connection to this continuum, this cosmic American musical continuum, as well as this pursuit of freedom," he says. Is It Time for Another '60s-Style Protest Movement? Does America need another '60s-style protest movement to recalibrate its political and social identity? McDowell is quick to draw a line between nostalgia for the past, and the very different realities of the present moment. "I don't know if we need another '60s, I think we need a 2018s or 2020s. We need our own [movement]. It's a new time with new challenges. With the Internet, we have the ability to mobilize people in a way that we've never had before, so I do think there is something to this 'power to the people' protest vibe of the '60s that's very relevant at the moment, and kind of scarily present." He points to the hundreds of thousands of Americans who poured into the streets this summer to protest the Trump administration's brutal treatment of refugee and migrant families seeking sanctuary in the US. "This is happening now," he says. "So in some cases it's a throwback to the '60s, but I definitely think that we're in a place where we're coming together in different ways, mobilizing in different ways. The '60s were about a split in generations. This is about a split in ideology, that is intense but it crosses generations. Which is kind of a brand new thing, at least for America." At the same time, McDowell says the intense ideological split is spurring people to become politically active as never before, and he hopes that this renewed sense of political activism contains the seeds of a resurgent democratic movement which will bring Americans together in defense of their fundamental rights and freedoms. He hopes it will translate into stronger voting turnouts, which he emphasizes are fundamental to bringing about real political change. Recording a benefit album is one way to politically mobilize artists and musicians. But are there other ways artists can or should involve themselves in the emerging political struggle? "I think in some ways being an artist or a musician in 2018 is really difficult," McDowell reflects. "It's financially very difficult ... so I think that just being an artist and being willing to do the work every day is in itself a political act. It's an act that is selfless in some ways, and it requires being willing to do the work, for not much reward. To me being an artist is a way of living that points toward a certain respect and dignity, a way of being free. "Can artists do more? Of course, I think that all of us can do more," he says. He reflects on some of the powerful political moments he witnessed growing up, in which musicians lent their efforts to spurring on movements for political change -- tremendous benefit concerts and recordings for human rights and civil liberties in places like South Africa, Tibet, East Timor. "These were cultural touchstones. I know our culture is so fractured, but music was really a huge part of changing culture at one time, not too long ago. "My motivation was really to create something that's not just a list of tracks, but a collection of songs with a point of view and a real sense of purpose. I feel like Spotify playlists or collections of tracks rarely have a point of view, and so I really wanted to collect things that are different, and show the state of songs and songwriting in this vein." The funds raised from sales of the album will be used to develop digital encryption tools and also support campaigns to defend the rights of journalists or support investigative reporting projects, McDowell explains. He picked the Freedom of the Press Foundation because, he says, they do three things extremely well. They defend public interest journalism, focused on exposing corruption and criminality by corporations and governments. They fight to preserve the rights of journalists and the First Amendment. And just as importantly, he says, they do practical work in the area of digital security, developing online tools to help make information transmission untraceable and encryption tools for protecting digital communication. Such protections are vital for a democratic society that to wishes restrain the power of the wealthy and of its own governments, he says. "This is the first line of defense that we have available to us as a society, a free and open society, is journalism, is people who are going to report, and talk about and dissect, and tell us all what's really going on." "There's definitely a sentiment that this ongoing concerted effort to diminish the power of journalism is working. And when you need someone to blame, and over and over you're being told who to blame -- whether that's immigrants, or minorities, or journalists -- it takes the onus off of you as a person to do something about it. You can just redistribute blame. And that's a powerful weapon of authoritarian governments. And we're definitely seeing it, I think people are starting to be a bit fearful." He feels that the combative nature of the current president and his political partisans appears to be having a dampening effect on some media, which appear reticent to respond as forcefully as they should in calling out lies and incorrect facts coming from the government. "This is on the very edge of censorship ... a crucial piece of journalism [is] to speak truth to power and root out corruption and speak honestly," he says. "Some may say that journalism needs to remain neutral, which is true in some respects, but it also has to be able to report on things that some folks might not want to be reported on. And that can be somewhat adversarial." America may be facing a difficult moment, but McDowell is confident that with work and commitment, Americans will come together to preserve and protect their democracy and civil rights. "I have lots of hope. I'm very optimistic ... I feel like [Americans] are a resilient bunch, we speak our minds, and I definitely have all of the faith in the world that we're going to come out okay. But it does require a certain amount of vigilant behaviour on all of our parts to speak up and try to do something. It's not going to just go away, because there are powerful forces at work, and a system and a country that's politically broken at the moment. So it's going to take work. We have a democratic government, by the people and for the people, and it's going to take all of us to get it back on the right track."